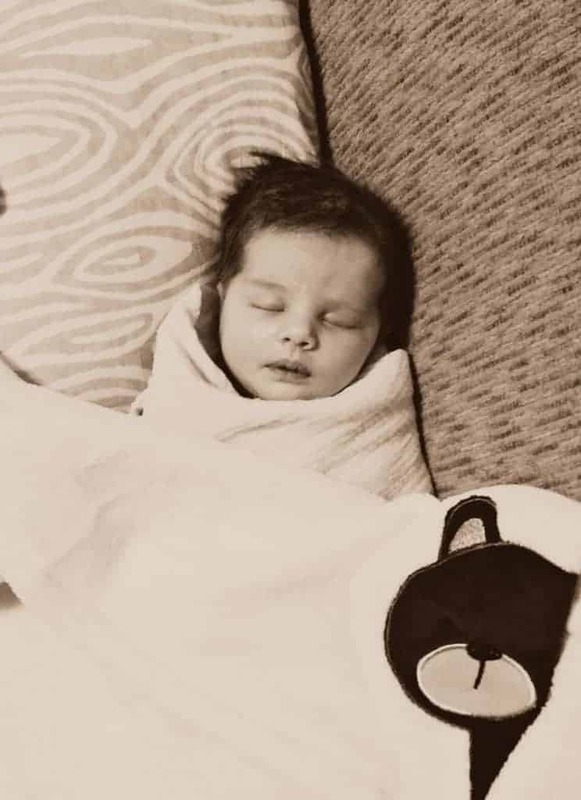 Can you believe it’s been three whole weeks since baby Graham was born? It feels like it’s been ages and the blink of an eye all at the same time. The passing of time is funny like that, isn’t it? He’s a sweet baby who is off of the lights for jaundice, has his days and nights all mixed up, and doesn’t love being awake. He wants to be nursing or asleep all day, every day. Life with five little kids to love is busy! Thank goodness my mom flew in to help out and my sister is still here. We’ll be flying solo next week and I’m definitely going to be tired at the end of the day. My two oldest started school this week, which makes them exhausted in the afternoon and the four-year-old is just out of sorts. He misses the other kids but is terrible to them when they get home. In other words, we are all tired and all the kids are fighting and grumpy by bedtime. Not quite what motherhood dreams are made of, but it’s real life. Normally a balanced diet and a good night’s sleep will keep me up and running, but I’m not sleeping yet. The baby is up a lot eating and fussing, and we still have a few other kids that wake at night. On top of that, I’m still recovering from pregnancy, birth, and I’m still bleeding. Under the circumstances, I feel like my body needs an extra boost. Since it isn’t coming in the form of rest and sleep, I’m trying hard to make sure it comes from what I’m eating. 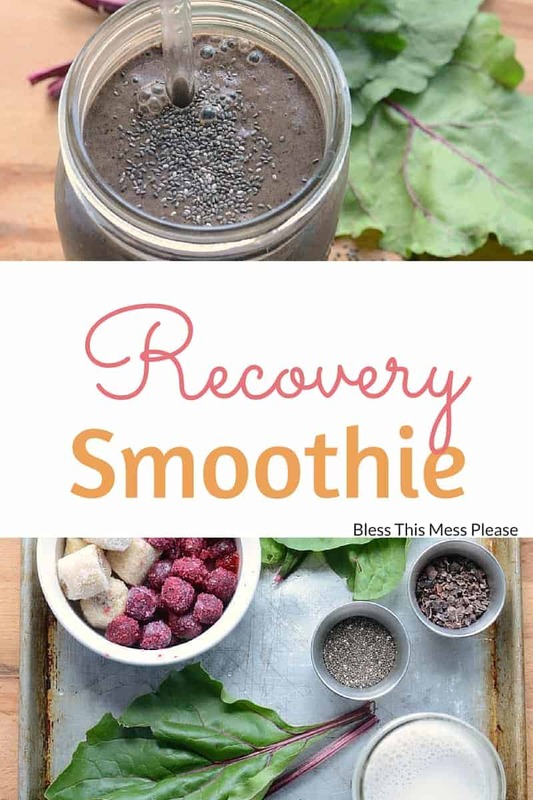 This postpartum recovery smoothie is awesome. Even if you didn’t just have a baby, it’s full of healthy stuff that might just be the boost that you are needing. I know I’m not the only one with a tired body and mind. 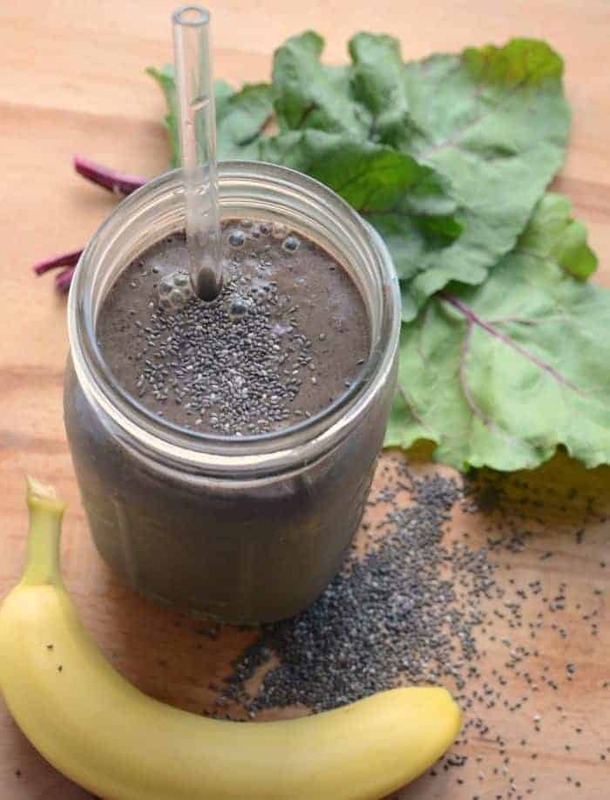 This recovery smoothie has Swiss chard, beet greens, dark sour cherries, banana, whole almonds, chia seeds, cacao nibs, and an almond coconut milk blend. I like to use unusual greens because they are going to have some different vitamins and minerals than your traditional spinach. Both chard and beet greens have a lot of iron, which is helpful for blood loss, and both pack lots of fiber. If you can grow these yourself you should! Then you only have to pick as much as you need. This smoothie is full of fiber. The nuts, fruit, and greens all have a lot and that’s good. Things “down there” are sore, swollen, and possible even recovering for some tearing, so fiber is your friend after a baby. 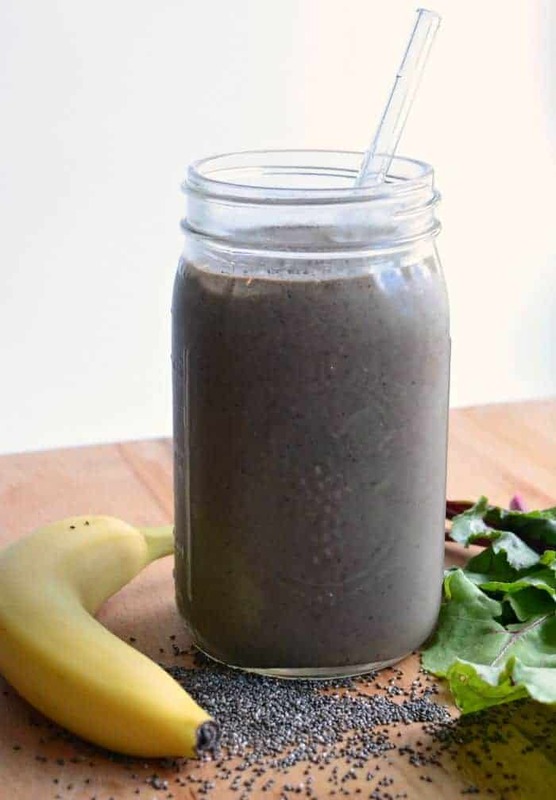 This Postpartum Recovery Smoothie is also full of healthy fat and protein. Nursing makes me super hungry and this really helps to keep me full and give me some energy. On top of that, the sour cherries are known for helping to reduce inflammation and swelling, both things you are battling post delivery. The chia and cacao nibs add some more fiber, great fat, and awesome flavor. Plus, the vitamins and minerals are replacing and adding to stores that you might have used up when you were pregnant. 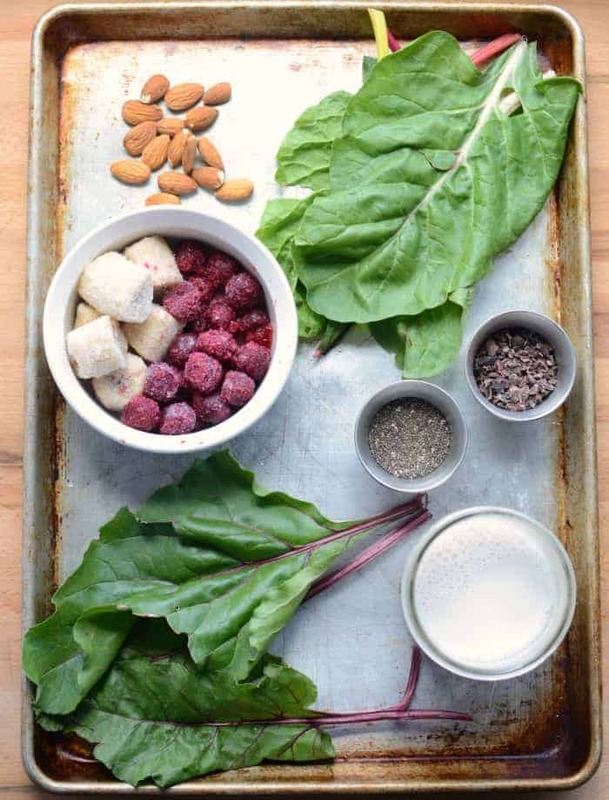 You really can’t go wrong with all the good stuff in this healthy smoothie recipe. Now I’m not a dietician or anything, but this combo of veggies, fruits, fat, protein, and super foods is really a winning team and one that has been making my mornings delicious as well. Don’t be too worried about the color, it’s quite sweet and tastes great. My toddler loves this smoothie! If you try this recipe, let me know what you think! Leave a comment, pin it, and don’t forget to tag a picture #blessthismesseat on Instagram. I love to see your kitchen skills in action! Throw everything into your blender and let it rip. You’ll be better off using a high-powered blender (I love my Blendtec) because the greens are a bit more fiberous than spinach. Process until smooth and enjoy right away. Thank you so much for all of your kindness and thoughtful comments. I sure like you guys. Baby G is gorgeous and you are an awesome mommy!!! All the best to you! Melissa, you are amazing! Graham is a sweetheart and so lucky to have you as Mommy! My two oldest are back in school and my 4 year old is going crazy! He is so rude to my oldest in the evenings. Poor kid, I think he is just lonely and jealous. I love your sweet baby Graham, and I hope your recovery gets better! You are awesome! I have done green smoothies immediately after my last two births (they were at home so I could do that) and they have been wonderful. My helper (my husband or my mom) made them for me from fresh garden greens, frozen strawberries and banana, orange juice concentrate + water, and a handful of Sheperd’s Purse, which is an herb/weed that grows here and is great for stopping bleeding. I could tell they were exactly what my body needed right then. Your recipe looks awesome and so nourishing! I hope it makes you feel wonderful! This looks awesome! I think my body could still use this 6 months post baby. Where do you buy cacoa nibs? I just buy them on Amazon and let the mail man bring them to me 🙂 I think most health food stores would have them too! Hang in there! My little girl is 8 months, and I’m just starting to figure out how to be a mom with 4 kids. It is wild and crazy and overwhelming all at the same time! I’ve been thinking of you and hoping that you are doing well. Just saw this on the Back To Her Roots smoothie ebook. My youngest is almost four and I am STILL recovering! 🙂 Looks great. Thanks. My youngest is 5 months and I kind of wonder if I’ll ever be back to “normal” LOL, it’s a great smoothie though! You’ll love it! Thanks to you, every smoothie I make has a handful of almonds and a scoop of cacao nibs in it! Just love the wee bits to chew on! AND its CHOCOLATE!!!! My addiction if fueled everyday now…..the “healthy” way!!!! !